The Euro range of cabins is amongst the most versatile and customizable we offer, without a doubt. 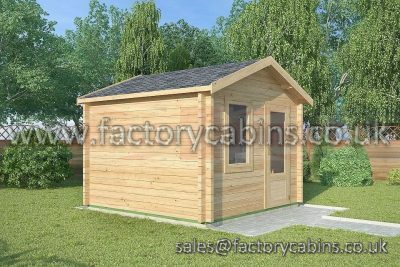 There are single room log cabins that can make a perfect garden office or studio. Our multi-room cabins can be the perfect family hangout spot or provide a reception area for those setting up a home business. The most extensive products in this range include 2 storey, 2 bedroom cabins that can offer real, livable space if your family is growing or if you simply have guests coming. The strong walls and thick floors help insulate the cabin and keep it sturdy, making it a perfect retreat no matter the weather. However, Log Cabins LVexcels in convenient, thoughtful cabin design as well as high standards of construction, with top-quality windows and doors to make sure that your new garden office, guest house, or studio has no weaknesses to worry about. Even the smallest of our cabins are built with quality in mind. The compact Euro LEISTEN, measuring at 2m x 2m, has a strong tongue and groove 28mm flooring, which is twice a thick as most cabins that size. All the Euro range is built using a Siberian pine structure, which won’t twist and split over time like the young spruce that many other cabin providers will opt for, instead. Make sure you spend time on timber treatment every 3 to 5 years to ensure your cabin maintains its quality for longer. With the right treatment, the Euro Range can last a lifetime. Besides partnering with Log Cabins LV to offer their extensive range of versatile, convenient, and excellently built log cabins, Factory Cabins works with you to make sure you get the service that works for you. You can further customize your bespoke cabin with a variety of different roofing options that we offer. What’s more, we take care of the entire installation process for you, so you don’t have to deal with the stress, yourself. Take a closer look at the extensive Euro range of log cabins, whether you want a garden office, studio, or something else entirely. If you have specific needs, don’t hesitate to call Factory Cabins on 01452223591 and we can help narrow down your options to what best suits you. At our display in Tewkesbury, you can also explore a much greater sample of our a few of our ranges to see and feel the quality in person.